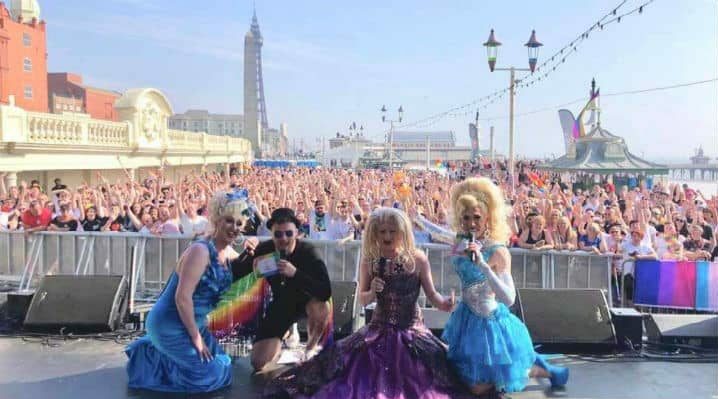 Now in its 13th year, Blackpool Pride is a wonderful weekend of festivities in Britain’s most iconic seaside resort to celebrate diversity, featuring a variety of entertainment and fun activities. VIP packages are available. This year, Pride Blackpool runs from June 8th-9th. Check our list of the best hotels & guesthouses in Blackpool for gay travellers if you’re planning to join. A massive free Pride festival in one of the England’s most attractive cities. 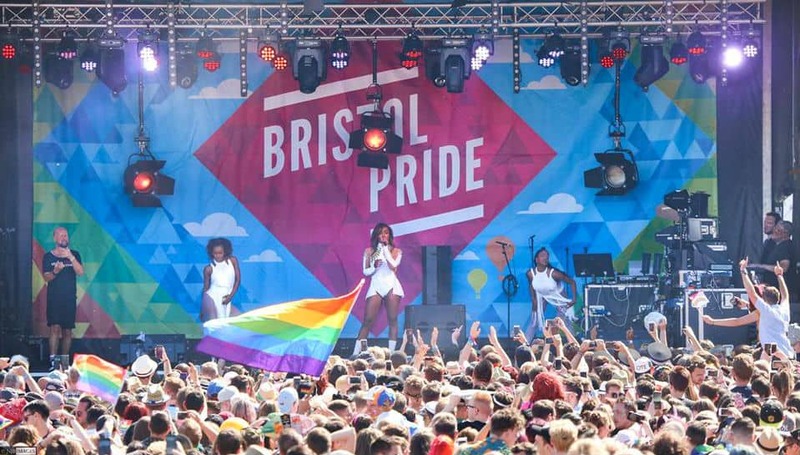 Bristol Pride is a 10-day festival that showcases, celebrates and champions the LGBTQ+ community in the South West of England. With a variety of events including live shows, cabaret and events for families, the main attraction is the Pride parade on Saturday 13th July through the city streets. 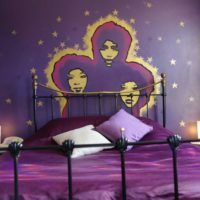 If you’re planning to be in Bristol for Pride, book your hotel early – check our list of top hotels in Bristol for gay travellers. Very popular gay Pride event in the UK since 1991. The Brighton & Hove Pride is an exceptionally friendly event and one of Brighton’s most popular weekends, attracting tens of thousands visitors from around the UK and beyond. The spectacular parade begins by the Brighton Wheel on Madeira Drive and continues through the town towards Preston Park. Expect plenty of colourful costumes, performances from top artists and a whole host of club nights . For hotel bookings, click list of recommended hotels in Brighton UK. 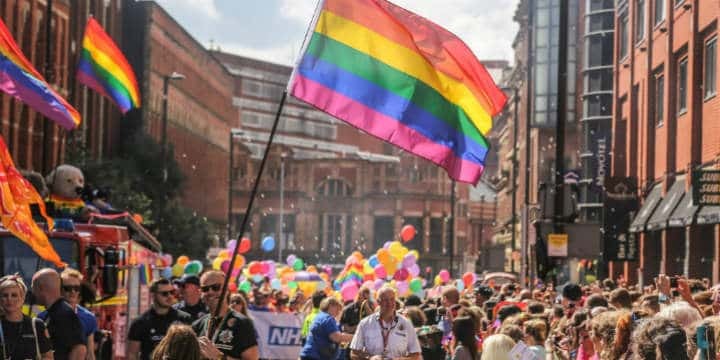 Manchester Pride’s Big Weekend in 2019 promises to be bigger and better than the previous year, taking place from August 23th-26th in the Gay Village (Canal Street). The Big Weekend features numerous art, culture, music, sports and debate events, with live music and various stalls and arenas hosting a wide range of activities. The parade will be on Saturday, August 24th, from around midday. Check the website for more details and full program. 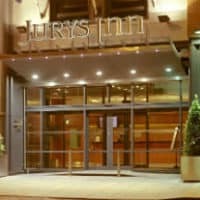 For hotel reservations, check our list of top hotels in Manchester for gay travellers. The Margate Pride Parade 2019 will begin in Cliftonville and continue on to the main sands. It’ll be the fourth consecutive Margate Pride. It’s a small town so it’ll be simple but fun and very inclusive. There’ll be speakers and live performances by local artists. Margate has a growing LGBT population. It has attracted many creatives fed up with the excessive prices of London. That community could well grow considerably in the coming years. Kate Bush is one of the greatest artists in the pop world and she has a huge gay following. Her music, videos and live shows are totally unique. There’s no one else like her and she has no rival. Sarah Louise Young will be stepping into the Red Shoes of La Bush for a night of high camp entertainment. Young will be recreating some of Kate’s most memorable performances and songs with an additional dose of madcap comedy. Say no to body shaming and yes to body positivity. Channel your femme fantasy and enjoy a drag performance from Freida Salves, thirsty go go dancers and banging pop tracks from DJ Tete Betty. 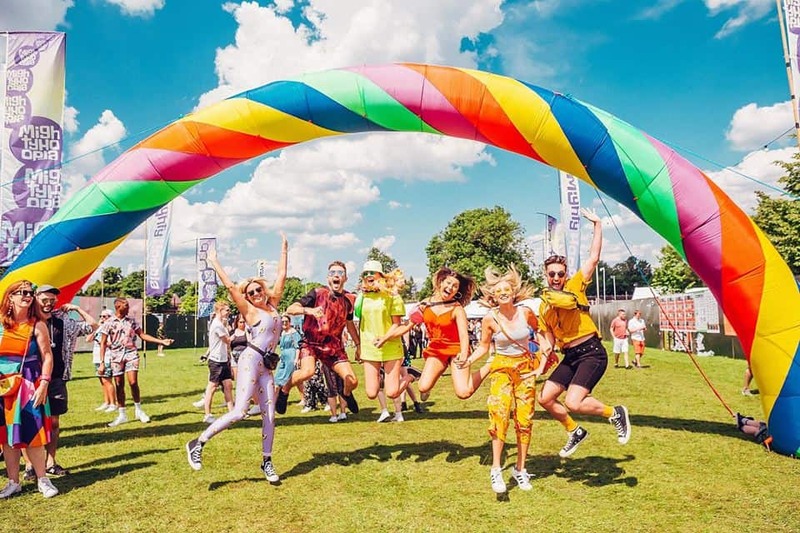 Mighty Hoopla is the biggest LGBT pop festival in London. It’ll be taking place in Brockwell Park on June 8. Headline acts include All Saints, Chaka Khan and Bananarama. Liberty X, Jamelia, Sink The Pink and U Ok Hun will also be in attendance. Last year Mel C performed Say You’ll Be There with a bevy drag queen Spice “Girls”. It’s guaranteed to be one of the most fun gay events in London this summer. The main headliner is yet to be announced. Who on earth can be bigger than Bananarama? Pride in London is a large LGBT festival in London with many fun activities, cultural events, stage shows and parties, attracting tens of thousands of participants each year. 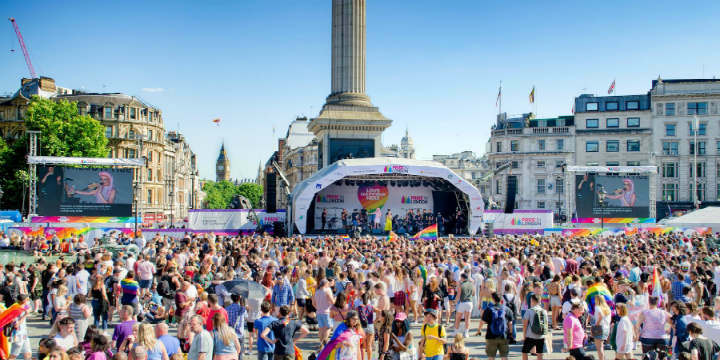 In 2019, the London LGBT Pride parade takes place on Saturday, July 6th, starting from the BBC Broadcasting House to Oxford Circus, down Regent Street, through Piccadilly Circus, Lower Regent Street, past Trafalgar Square and into Whitehall. During this period, many gay bars, gay nightclubs, gay cruise clubs and saunas across London keep the fun going all night long, hosting various events and parties. Planning to be in London for Pride 2019, check our list of top hotels in London for gay travellers. The Drag Ball returns for its third instalment. This will be the largest drag convention in Europe this year. 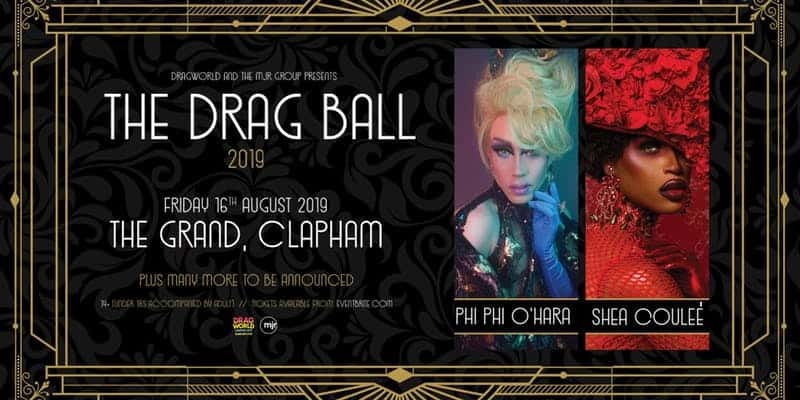 Top stars from RuPaul’s Drag Race will be in town, including Phi Phi O’Hara and many more. Scotland’s largest LGBT event. The annual Pride Edinburgh 2019 festival takes place on Saturday, June 22nd, run entirely by volunteers, the traditional march and rally attracts thousands to the streets to promote and celebrate pride. Tourists can mix with locals, politicians, campaigners and even celebrities. Besides the march, there’ll be plenty of activities, events and parties – check the website for more details. For hotel reservations, check our list of the best hotels in Edinburgh for gay travellers. Fun 2-day LGBT festival on the last Bank Holiday weekend of May. The Birmingham Pride keeps getting bigger and bigger. The carnival parade kicks off on Saturday at around noon, along with stage shows, cabaret marquee, dance arena, fun-fair and street party. Birmingham’s thriving gay clubs and bars around Gay Village will be hosting various parties and activities. 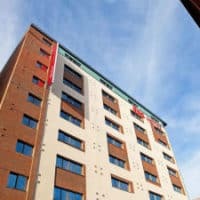 Planning to join Birmingham Pride, check our list of top hotels in Birmingham for gay travellers. Popular gay Pride event in one of England’s most historic cities. 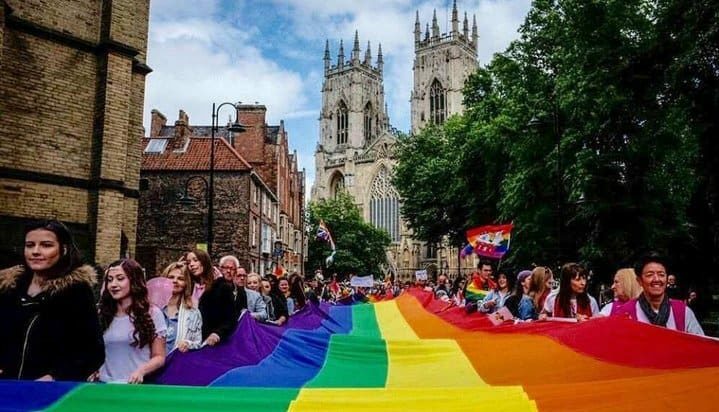 York Pride is a celebration of diversity of the LGBT community of York and North Yorkshire with a focus on entertainment, inclusivity and fun. This year, the event takes place on June 8th. Thinking of attending? check our list of top York hotels for gay travellers. Click here for Travel Gay's extensive gay parties and events page. top trending hotels in Oxford.